Today, there are an estimated 5.4 million Americans living with Alzheimer’s disease. And while most people associate the disease with old age, the fact is there are 200,000 Americans under the age of 65 living with it today. As with all forms of the disease, early-onset Alzheimer’s is a progressive, terminal disease, which cannot be prevented, cured or even slowed. Since the onset can occur in people as early as in their 30s and 40s it often strikes during an individual’s prime working years, and as the disease progresses it prevents gainful employment. As a result, individuals are coming to grips with a devastating diagnosis all while losing employment and the salary and benefits that come with being employed. These individuals and their caregivers then must figure out how they will pay for their care. Thankfully, since 2010 the Social Security Administration (SSA) has helped these individuals by adding Alzheimer’s disease to its Compassionate Allowances Initiative. The initiative identifies debilitating diseases and medical conditions that meet the SSA’s disability standards for Social Security Disability Income (SSDI) or Supplemental Security Income (SSI). This allows for faster payment of Social Security benefits to individuals with Alzheimer’s disease, mixed-dementia and Primary Progressive Aphasia. The Alzheimer’s Association actively worked with the SSA for the inclusion of early-onset Alzheimer’s disease and advocating on behalf of individuals with early-onset (younger-onset) Alzheimer’s disease. As the SSA was considering this decision, the Alzheimer’s Association provided comments to the administration and commissioner, held numerous meetings with SSA staff to advocate for the inclusion of Alzheimer’s disease and related dementias, and Alzheimer’s Association CEO Harry Johns testified during the SSA’s public hearing about the inclusion of early-onset Alzheimer’s disease. Since then we have worked closely with the SSA in support of the implementation of this Initiative nationwide and to educate our community about this benefit. And since its implementation it has had a profound impact on the Alzheimer’s community, helping thousands of families including Tom and Julie Allen. Tom was looking for a way to help manage the costs of Julie’s Alzheimer’s care, since his retirement and two part-time jobs were not enough to cover the large costs of Alzheimer’s disease. Through working with the Alzheimer’s Association and the SSA he was able to secure for Julie the SSDI benefit. Social Security benefits are very important to individuals with early-onset who are unable to work and have no other source of income. At the Alzheimer’s Association we hear from family caregivers about the challenges they face paying for care. As was the case with Tom, the financial complications and solution finding falls to the caregiver. That is just one of the reasons why we celebrate November as National Family Caregiver Month and we take time to honor the 15 million caregivers for those living with Alzheimer’s disease. To learn more about how SSDI works and if it may be available to you, visit www.alz.org/SSDI or call our 24/7 Call Center at 1-800-272-3900. This blog appeared originally on the Social Security Administration website blog. What a great example of the crucial role the Alzheimer's Association plays in educating policy makers who may not know about the impacts of this illness. Bravo, this is a positive step in the right direction! My mother passed away from early onset of Alzheimer’s at age 59, my brother who worked as an EMT for the FDNY is currently in palliative care and he is 58. In 2015 I decided to get tested to see if I inherited the gene mutation for early onset and I did. I am 48 years old. Why isn’t there more chatter about early onset? I live in Pennsylvania in the Lehigh Valley area and there is NO SUPPORT, for me, my husband and our children. I am not staying quiet anymore. Things have to change, we need funding, research and support. My husband is 63 – diagnosed 3 years ago. Positive step with SS but there is still a waiting period and during that time there is the matter of health insurance. And, I am the caregiver but still work full time and hope I can work until I am 65; otherwise, what will I do for health insurance with no income if I need to care for him full time? I need to stay healthy to care for my husband but if I quit work I will have no health insurance and no way to pay for any either. The early onset is definitely a "Catch 22" situation. As part of the Association's efforts, the Early Stage Advisors at that time participated in the hearings. At least one couple spoke and others wrote comments supporting the efforts to add AD and other brain degenerative diseases to the Compassionate Allowances list. My comment is still posted on the "Statements From Family Members And Individuals With Early-Onset Alzheimer's Disease". My comment is the one from Colorado, #5 in the list and I attended the hearing as an ESA member. I too am struggling with early onset ALZ in my family. My husband has been having memory problems for the past 4-5+ years. I live in a very rural, poor community and find there is nothing much in the way of support here for me as well. Its the case of “We make too much to qualify for assistance but not enough to make it on our own…” I even looked for a nearby, daytime, support group to provide me with some emotional support and find everything is at night and in a distant city of an hour drive (or more) each way. I have an autoimmune condition myself, have limited energy and cannot drive to a nighttime support group. I don’t expect to be given everything but asking for a daytime support group is that too much to ask for? Hello Donna. Where are you located? This is a great benefit, except for individuals who, like many women, have served ("worked" is not an allowed word) as homemakers for the 10 years prior to applying for benefits, and thus do not meet the "20 in 40" SSDI requirement. We still do not have any available benefit for these young onset Alzheimer’s patients who also don't qualify for state or county benefits that kick in at age 65. Thank you for this information. I was diagnosed with early onset, coupled with seizures, and now I had to leave my job and will not be able to return to work; I just turned 58. I just applied for SSDI and they responded that I have to meet with a Psychiatrist for an evaluation. Is this a common practice in their decision making process? This kind of rattled me. Thank you for any insights you would be willing to share. This is the 1st time I have seen this sight. I am interested in any & all new information. My mother had Alz. and her father had it and now I have it. My mother gave her brain to science and they sliced it all up to learn what was going on. That was 2001. Since 2003 I have been followed. My main problem is the the short term memory. It can be forgotten within a few seconds or minutes. It is problematic for my husband and I. I am 75 yrs. One of my problems is that I do something, like make breakfast and forget to eat it. I could leave things cooking on the stove,and forget, so I hang onto the stove. However there is still the possibility of my forgetting. I am fortunate to have a husband, but he naturally can't understand how problematic it is for me & him regarding daily life. I am intelligent, am a writer & poet as well as an artist. My work has been exhibited over the years. I have had a very interesting life and lived for ten years in Afghanistan, my husband's country. The main issue, besides knowing that one is loosing one's "marbles," is that I know, full well, how the future will proceed. This situation is probably as hard on my husband as it is on me. 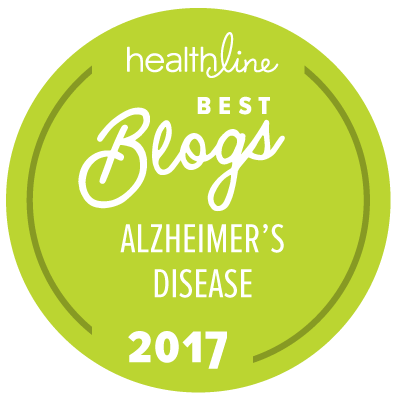 It’s wonderful to know there are those advocating for individuals with Alzheimer’s disease, and the families who care for them.